Leadership at Severn takes on many forms, but in the heart of every student who takes on a leadership role is the drive to achieve a greater good. Severn students have the courage to lead their peers toward something bigger than themselves, toward building a stronger community through shared values and sense of purpose. We foster these qualities through intentional, expansive, and inclusive leadership programs for all students. Throughout Severn's history, our students have graduated into leaders of every kind — leaders in their communities, their nation, and their world. Today, our commitment to fostering leadership in our students runs deeper than tradition, it's part of our DNA. It’s dynamic and entwines through every facet of our school. In his opening remarks to the school at convocation this year, Headmaster Doug Lagarde discussed a three-word phrase from Severn’s mission statement - a lasting desire - and emphasized that it is developed through both purpose and practice. Severn’s leadership programs are intentionally woven through each student’s experience so they can find purpose in their lives and learn the skills necessary to make a difference in the lives of others with opportunities to practice those skills both in and out of the classroom. In November 2010, Doug Lagarde set out his vision for an intentional leadership training program at Severn. Mr. Lagarde’s vision has become a reality and can be seen in every grade level. In addition to extracurricular programs like Student Council and Helping Hands, all Lower School students receive grade-specific leadership training, including but not exclusive to, problem-solving in the natural play area (PK-1), entrepreneurial studies (Grade 2), explicit leadership studies (Grade 3), a collaboration on world projects (Grade 4), and FLIGHT (Grade 5). In the middle school, students are taught leadership skills in programs such as Student Council, Community Life, Middle School Community Service Day, and the Admirals’ Pen. Upper School students come together three times a year for Leadership Labs to intentionally evaluate and improve student-life at Severn. Each year, they identify and work through a different adaptive challenge which frames student council initiatives and club activities throughout the year. The challenge must be one with no known solutions that can be integrated into all aspects of life in the Upper School. Past challenge topics include: Taking the Initiative, Active Appreciation, and Respect. This year’s theme is “Unity,” a challenge to promote inclusion and a sense of belonging at Severn. Upper School, students also receive grade-specific leadership training through the Seminar Program. 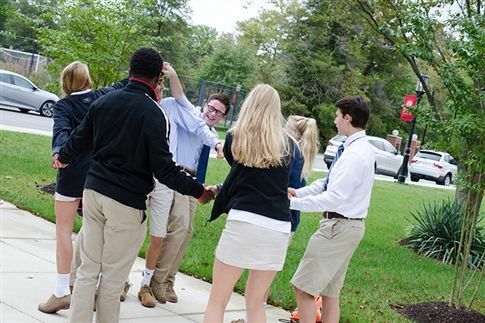 “When we began planning this curriculum,” says Bea Fuller, “we worked backward, asking ourselves, ‘What tools do we want to give our students to be leaders in the world beyond Severn?’” The result is a Seminar Program, taught by the School Counselor, the Grade Dean, the Dean of Students, and the Head of Upper School, where each grade level addresses a different leadership theme. Sophomores focus on “Getting to Know Myself,” identifying and working with their values, biases, and strengths to positively impact their community. Juniors focus on “Getting to Know Others,” learning communication and relationship-building skills. Seniors focus on “Leading and Leaving,” examining their roles as leaders at Severn and also their responsibilities as they prepare to move on. Love this and want more? Read the full article in our Winter 2018 Camaraderie Issue of The Bridge! Community building activities help our students develop strong leadership skills.